Trinity Designs: Monkey See - Monkey Do! As you can see, this post has NOTHING to do with Monkeys! Well, not really. You see, I was cruising my favorite blogs yesterday when I saw this post here on Patti Chesky's blog. And when Patti posts something this cute, I just have to eat a banana and climb a tree! LOL! 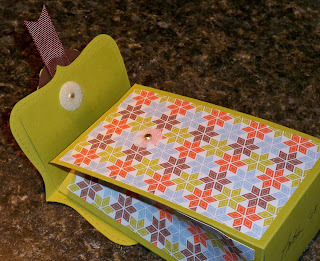 I just loved the idea of her little purse and it inspired me to create this box. The 2, 5, 7, 10 box is the basis for this project and a tutorial can be found here for the basic box. 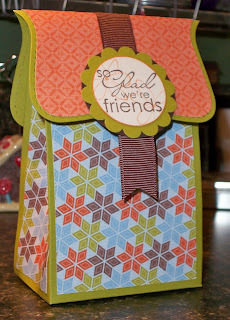 My box is done with Kiwi Kiss cardstock and I covered all four panels with smaller pieces of Frosty Day Designer Series Paper from the Holiday Mini catalog. I used Sticky Strip to form the box so it would be sturdy and I used the Tombow Multi Purpose Adhesive to glue on the paper panels. This is actually the first time I've used that adhesive for paper on cardstock and it worked great! There is definitely a learning curve, but I was very pleased with the results. I took Patti's idea of using the Top Note Die from the Big Shot to jazz up my top flap a bit. The Top Note was cut twice once in Kiwi Kiss and once in the Frosty Day paper. I just used the opposite side of the same piece this time then I trimmed off the perforated edge so the Kiwi Kiss would outline it. After folding the Top Note pieces in half and adhering them with more Tombow, I used Sticky Strip to attach the Top Note to the box flap. I cut a piece of Chocolate Chip Wide Grosgrain ribbon and used Sticky Strip to attach that as well. As you can see from the photos (I hope) I used a velcro dot as my fastener but gave it some extra security with two Gold Brads. The little medallion/greeting was created with the 1 3/4" Circle punch on Chocolate Chip, the Scallop Circle punch on Kiwi Kiss and the 1 3/8" Circle punch on Very Vanilla. 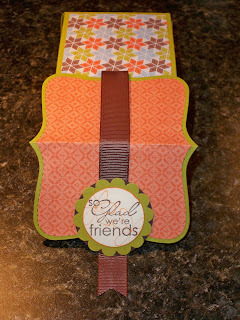 I stamped the sentiment from the Best Yet stamp set (Level 1 hostess set) and stamped two flowers from the Live Like You Mean It stamp set (also Level 1 hostess) in Tangerine Tango ink. The flowers were inked up and stamped off one time on Grid Paper. Lastly, I edged the Vanilla piece in Tangerine Tango ink and snailed them all together and attached the whole thing to the box with Sticky Strip. You are VERY welcome!! I'm glad you liked it. See...something good can come from a long drive through the cow-stinky corn fields!!! Your box is stunning!! Love all the patterned paper details. This is too stinkin' cute!!!! I am sooooo making one of these!!! TFS! Wowzer Robin! How did I miss this yesterday?